Glenis insisted that we do this paddle. Now Glenis is someone you take notice of, and if she says do it, just do it. 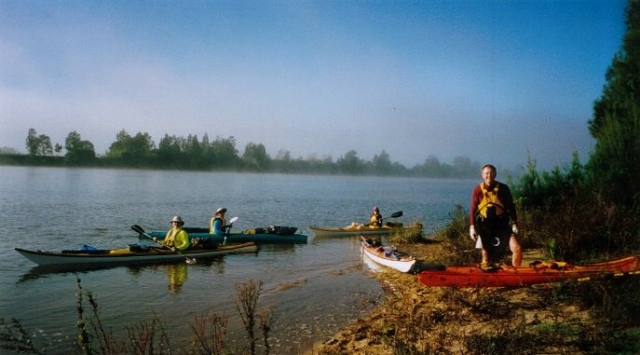 In fact it was Glenis who introduced us to paddling in the first place. So, really it's thanks to her that we had seven boats, no garage for the car, stalling of house renovations ... you know how it goes. 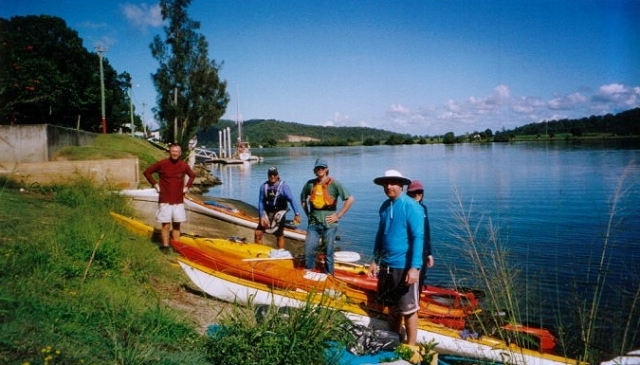 It has been some years since we did this four day paddle down the Clarence River. It was our first long trip and first time camping. As you would expect we had some salient lessons. Lesson One: Be on time. The getaway for the long car shuttle was delayed by Brian who turned up late, very late in his Holden HR sedan. (Brian has since become a reformed man with only the odd lapse.) By the time the drivers returned to the start the sun was getting low and we were under pressure for time. Lesson Two: Do a test pack. No matter how hard we tried, those extra tins would just not fit. The yoghurt was put next to the dry ice and the hatch jammed down on the Osprey. Lesson Three: Be flexible in decisions. On account of the failing light Plan A became Plan B and we pulled up well short of the intended destination. The consequences of Lesson Two became apparent. Lifting the lid of the rear hatch I found frozen yoghurt splattered everywhere. The containers had exploded when the hatch cover was jammed on, and while the dry ice had had the decency to freeze it in its tracks, it was still a messy disaster. A grumpy domestic dispute ensued, slightly modified in its intensity on account of people we did not know being within earshot. Today we needed to do the extra distance to get to the original planned destination. This is the day I learned to paddle. The weekend before I had torn my right bicep. A nasty way to find out why you keep your elbows in tight whilst trying to brace on a wave and set the scene for my ongoing surf paranoia. My arm was a painful motivator to use my torso and twist to pull the paddle through the water. It was a long, very long day and I remember being totally stuffed by the time we pulled up on the island to camp. Mitch and Peter were zipped up in their tents by the time the West Enders bought out the appetisers and casks of wine. Yes, I know good Club Membership, the priorities of the West End Canoe Club (AM tea and sundowners) suited us just fine. On this trip I paddled Mark's new Osprey while he took the Platypus, otherwise called the green barge on account of it's rubbish carrying ability and the way it moves through the water. On this paddle was Peter. Now Peter is a spirited paddler and Mark is strong. On the way back from the pub to the island a testosterone driven paddle flat blatt back to the island whipped up. That 4.5m green barge can move surprisingly quickly when powered by strong and determined arms. Before reaching the island Peter had dropped off. Nothing was said. With both Mitch and Peter on the trip there was a lot of potential here and Anthony obligingly stirred the pot. On Day 3 I was concerned that the older chap (Brian) decided to take his time and get his boat down to the water after everyone else had gone. Lifting a heavy weight like a laden boat can be the way to find out about the previously silent coronary disease. Fretting (with my hand on an aspirin) I left with others. I almost had a crick in my neck from constantly looking around for him. Well I now know that people like Brian and Mitch are a bit like older bushwalkers - tough as weeds. Peter's was to stay out in front. Mitch's was to wander and paddle like a windmill. Brian goes helter skelter until pooped. Anthony will make it look easy and power along at 10kph no matter what, while Bill will amble along at whatever pace is required. David's is to port the gear for Glenis and Glenis's (thank goodness) was for frequent breaks and pit stops. Malcom's was to make it to the next campsite. There is nothing quite like squelching up the main street of town in wet paddling shoes wearing lycra. Also creates opportunities to check out the local pub or bakeries. Wow, does this river move. As we left Grafton the tidal flow was almost scary and the river had huge swirling eddies. Dipping the paddle in we were making up to 11kph. There is no place to hide from the power of a giant river. This trip was his first ever paddle. While his paddling garb (jeans and leather jacket) might have been more suitable for other occasions you have got to hand it to Malcolm for giving it a go.